PM #40762529 $5.00 • Vol. 30, No. 2 January 14, 2019 L AW TIMES C O V E R I N G O N T A R I O ' S L E G A L S C E N E • W W W . L A W T I M E S N E W S . C O M New rules proposed for charities to employ lawyers Charles Gluckstein says he has concerns that the discussion around alternative business structures may persist beyond the scope of non-profits. Photo: Laura Pedersen OSC SETTLEMENT Emerging jurisdictions a focus for agency P4 UBER RULING Important for workers, advocates P7 FOCUS ON Tax Law P8 BY ANITA BALAKRISHNAN Law Times O ntario lawyers and bencher contenders say they are hoping that new proposed rules for alternative business structures limit the corporate inf luence on lawyers, as a long-standing debate on the issue comes to the fore this spring. A consultation period for a Law Society of Ontario proposal for lawyers and paralegals to provide legal services through charities and not-for-profit corporations ends Jan. 18. A report on alternative busi- ness structures should come be- fore Convocation this spring, on a topic that has been hotly contested in the past. The issue also emerges amid an election for new law soci- ety benchers in Ontario. The next election in Ontario is April 30. The idea of expanding the legal industry outside of the traditional law firm model has particularly been a hot-button issue in law so- ciety elections in the past. In Alberta's 2017 bencher elec- tion, for example, candidates raised concerns about being able to regulate alternative businesses structures. In the Law Society of Ontario's 2015 election, the On- tario Trial Lawyers Association came out in support of candidates that specifically opposed alterna- tive business structures. Charles Gluckstein has been in- volved in the issue for several years through the OTLA. He says the organization had expressed concerns that certain alternative business structures could present conf licts of inter- est: for instance, a firm might drop a class action lawsuit because it is not moving fast enough to meet profit goals; or it might present quid pro quo opportunities for donors to civil service organiza- tions to get legal services. He said there was specific con- cern that Ontario lawyers could fall prey to "bottom line" pressures like those faced by lawyers in the U.K. and Australia. "[In 2015], we had warned the law society of the risks of having a non-majority-lawyer-run law firm. The law society did listen to us," says Gluckstein. Gluckstein says that, apart from a few minor tweaks, the law soci- ety's proposal has support among trial lawyers, but that it's only the See ABS, page 2 Osgoode alumni call for lower tuition BY ANITA BALAKRISHNAN Law Times A group of recent alumni of York University's Osgoode Hall Law School says they will no longer donate to the school until tuition is reduced. The alumni announced their intent to stop donating in a Jan. 7 open letter addressed to interim dean Mary Condon. "That will be our last financial contribution to Osgoode or York University . . . until such time as Osgoode reduces tuition to a rea- sonable level — and thereafter only increases it with clear, specific, evidenced and public reasons," the letter said. The letter was signed by nine lawyers who graduated between 2012 and 2016. The group also put out a peti- tion, which has since been signed by about 100 people. Heather Donkers, president of the Law Students' Society of Ontario and a student at Osgoode Hall Law School, has signed the petition put forth by alumni. "I have been one of the lucky ones, in so far as I came from a low-income background and I had much, much debt when I applied to law school," Donkers says. "I myself have reaped the bene- fits of bursaries." The petition calls for students to notify the school that they will not make financial contributions until there is lower tuition and a long-term plan to make law school affordable for all prospective students. Tuition and fees for domestic students is $28,649.22 for incom- ing students and $28,577.74 for upper year students, the school's website says. 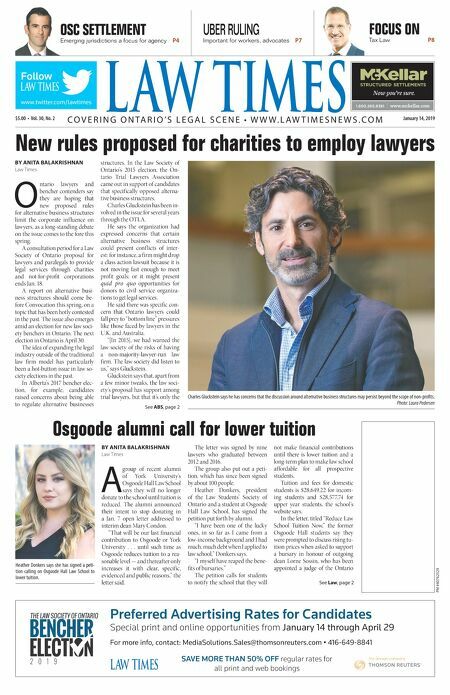 In the letter, titled "Reduce Law School Tuition Now," the former Osgoode Hall students say they were prompted to discuss rising tu- ition prices when asked to support a bursary in honour of outgoing dean Lorne Sossin, who has been appointed a judge of the Ontario See Law, page 2 www.twitter.com/lawtimes Follow & $#&!&jmmm$cYa[bbWh$Yec ntitled-4 1 12-03-20 10:44 AM Preferred Advertising Rates for Candidates Special print and online opportunities from January 14 through April 29 For more info, contact: MediaSolutions.Sales@thomsonreuters.com 416-649-8841 SAVE MORE THAN 50% OFF regular rates for all print and web bookings Untitled-1 1 2018-12-20 3:40 PM Heather Donkers says she has signed a peti- tion calling on Osgoode Hall Law School to lower tuition.